White rice is a good source of complex carbs and it has a small amount of vitamins and protein, but it contains very little fiber and loses many of its natural nutrients during processing. 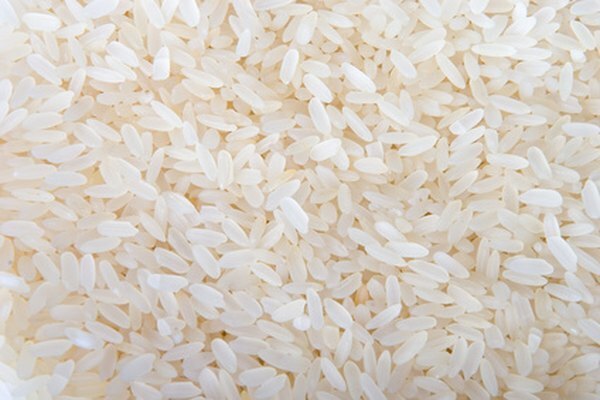 To produce white rice, the germ and bran layers are removed from the whole grain. Unfortunately for white rice, most of the grain's fiber and a large percentage of its minerals are found in the germ and bran. Different varieties of uncooked white rice contain very similar amounts of calories. One-quarter cup of uncooked long-grain white rice, which yields three-quarters to 1 cup of cooked rice, has about 170 calories. Short-grain and medium-grain varieties contain slightly more, about 180 calories. This is most likely due to the fact that one-quarter cup holds more of the smaller-sized grains. Specific brands may contain slightly more or less, so check the label on the brand you buy. Uncooked white rice is virtually fat free. Even an entire cup of uncooked white rice only has 1 gram of fat. Rice contains very little to no sodium. Uncooked glutinous rice, a type of white rice with high amounts of amylopectin -- a sticky starch -- has 3 milligrams in one-quarter cup. The same portion of uncooked long-grain rice contains 2 milligrams of sodium. The Institute of Medicine recommends that healthy adults limit their sodium intake to 1,500 milligrams daily. The negligible amount of sodium in rice can easily be part of a low-sodium diet plan. Carbohydrates provide the energy your body needs for physical activity and proper functioning. One-quarter cup of uncooked white rice contains about 35 to 40 grams of total carbohydrates. Most of the carbs in white rice are in the form of starch, which is a complex carbohydrate. While starch is great for energy, when too much starch quickly enters your blood stream it causes an unhealthy spike in blood sugar. Some of the sugar goes to your cells for energy, but excess sugar is quickly stored as fat. Frequent consumption of foods that boost blood sugar can cause weight gain, insulin resistance and Type 2 diabetes. Rice is a good source of manganese, which is a mineral that works as an antioxidant and helps metabolize nutrients. It's also essential for forming healthy cartilage and bone. One-quarter cup of unenriched, raw white rice contains about 24 percent of your recommended daily allowance. The same amount of uncooked white rice contains 4 percent of your RDA of zinc, magnesium, niacin and vitamin B-6. Many brands of white rice are enriched to add nutrients back to the grain, which makes it a good source of B vitamins and a variety of minerals. However, the amount and type of nutrients added varies from one brand to the next. Since brown rice is a whole grain with the bran and germ intact, it retains all of the natural nutrients. While white rice is fortified with vitamins and minerals, the fiber is never added back to the grain. Brown rice has three times more fiber than white rice. This makes a big difference to your health because fiber helps lower cholesterol and keeps your digestive tract regular. When compared to white rice, the most important difference is that fiber slows down the rate at which carbs enter your blood stream, so brown rice does not cause spikes in blood sugar.